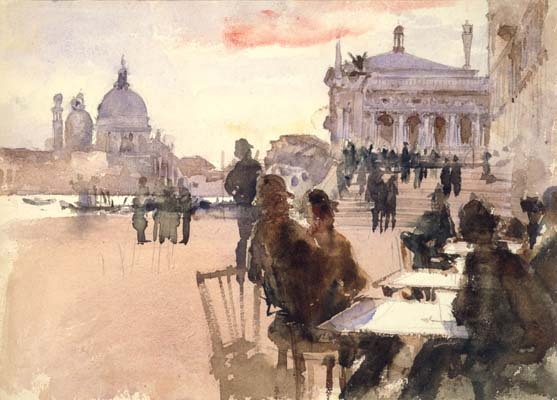 Sargent and Venice, a spectacular artist’s view of the fabled city, was shown in an exhibition that opened in January 2007 at Adelson Galleries in New York city. John Singer Sargent (1856-1925), one of a few truly international artists of the 19th century, had a love affair with Venice: he traveled there numerous times over 40 years. Adelson Galleries in New York, noted for its expertise in American art and the work of John Singer Sargent in particular, has organized an exceptional loan exhibition, Sargent and Venice, comprising of approximately 60 oils and watercolors painted by the artist from the 1880s until 1913. The exhibition was on view at the gallery from January 19 through March 3, 2007 and then traveled to the Museo Correr in Venice —marking the artist’s first-ever solo exhibition in that city—from March 24 through July 22, 2007. A majority of the paintings shown are on loan from private collections and have rarely been on public view; several institutions, including the Brooklyn Museum, Philadelphia Museum of Art, The National Gallery of Art in Washington, D.C., the Royal Academy of Arts in London, and the Museo Thyssen-Bornemisza in Madrid, have loaned important works as well. 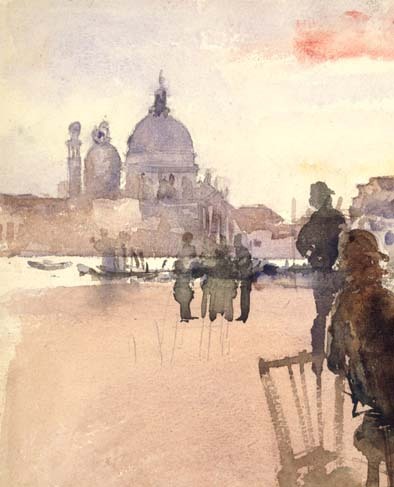 Inspired by the idea of retracing Sargent’s routes down the Venetian waterways, Warren Adelson, president of Adelson Galleries and the sponsor of the Sargent catalogue raisonné, saw this approach as a means to gather together the Venice pictures that appear throughout several volumes of John Singer Sargent: The Complete Paintings (Yale University Press). It was the first such exhibition in New York (Adelson Galleries) and, remarkably, the venue at the Museo Correr in St. Mark's Square in Venice was the first exhibition of Sargent ever held in that magical place. John Singer Sargent was born in Florence to American parents and lived most of his adult life in England. Widely recognized as the preeminent portrait painter of his generation, he felt equally at home in Europe and the United States where he painted many of the most notable social and political figures of his day. After “Turner and Venice”, Sargent and Venice was another show which charted a great artist’s response to the city and its lagoon. Venice was, in fact, the place best loved by John Singer Sargent (1856-1925), the most important of American ‘Impressionists’, who was born in Florence and lived for most of his life in Europe. Housed within the neoclassical rooms on the first floor of the Museo Correr, the exhibition – curated by Warren Adelson, Elizabeth Oustinoff and Giandomenico Romanelli– was the fruit of collaboration between the Musei Civici Veneziani and Adelson Galleries of New York; it included approximately sixty works (paintings and watercolours) dating from 1880-1913. There were loans not only from the Brooklyn Museum, the Philadelphia Museum of Art, The National Gallery of Art in Washington, D.C., the Royal Academy of Arts in London and the Thyssen-Bornemisza in Madrid, but also from numerous private collections. Thus, the public had the opportunity to see masterpieces that are rarely if ever placed on public display. An accompanying book (published in Italian by Electa) contains essays by scholars including Warren Adelson, Elaine Kilmurray, Elizabeth Oustinoff, Richard Ormond, Rosella Mamoli Zorzi and Giandomenico Romanelli. Like J.W.Turner and other great nineteenth-century artists, Sargent was fascinated by Venice. The man himself had grown up in cultured cosmopolitan circles in Italy, France, Spain, Switzerland and Germany. In Paris he had studied under Carolus-Duran and then enrolled at the École des Beaux-Arts before embarking on a career as a portrait-painter. A friend of Monet’s, he would in the second half of the 1870s undertake a number of study trips, experimenting ever more extensively with peinture en plein air. The exhibition layout was completed by an unusual and surprising section dedicated to such contemporary Venetian painters as Milesi, Tito, Selvatico and Nono. A leading figure in a number of Venice Biennales, Sargent undoubtedly had an influence on these men; but at times he himself may have been influenced by their work. was to become one of the artist's most famous and oft-reproduced images. 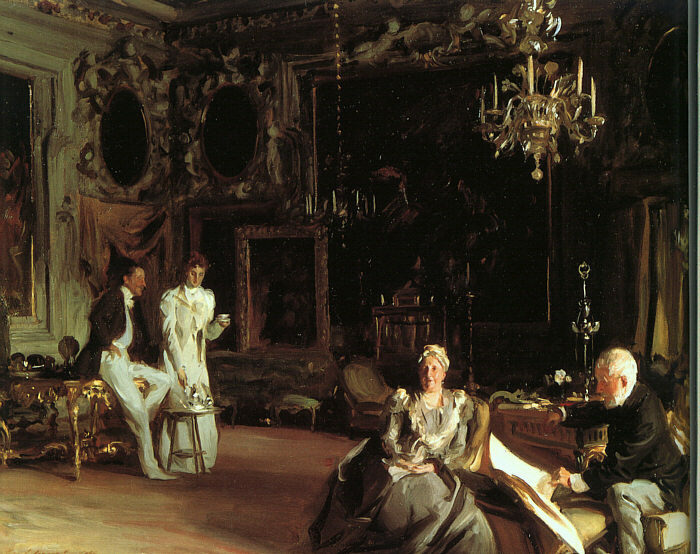 When Sargent presented the picture to Ariana Curtis, she refused it, finding the likeness of herself unflattering and the raffish pose of her son Ralph, hand-on-hip, casually draping himself on a gilded table, "indecorous." Her vanity and prudery were to become the family's loss and the Royal Academy's gain. The artist subsequently gave it to that institution as his diploma picture on being received as a full member, and the Academy has been its owner ever since. Roger Fry, the critic and member of the Bloomsbury group in London, accused the artist of reacting to Venice "for all the world like an ordinary tourist" - a verdict few who see the pictures today will share. Certainly contemporary buyers and collectors did not concur. In the two-day-long auction at Christie's of the contents of the artist's studio after his death, the Venice pictures were the subject of frenzied bidding. One watercolor alone reached the then-staggering sum of £4,830. 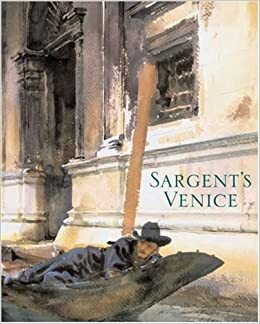 This gorgeously illustrated book presents nearly seventy of Sargent’s oil and watercolor paintings of Venice, many of them famous but others only rarely seen. The book also contains fascinating new photographs of actual sites depicted in Sargent’s paintings. Sargent’s early works in Venice were created in 1880-1882, and he undertook a second, larger body of work in the city during visits from 1900 to 1913. His responses to Venice—its local figures, its buildings and waterways, its extraordinary light—reflect his changing interests over time as well as his lifelong ability to extend his own reach as a creative artist. The book considers various aspects of Sargent’s work and milieu in a series of informative essays by international scholars. 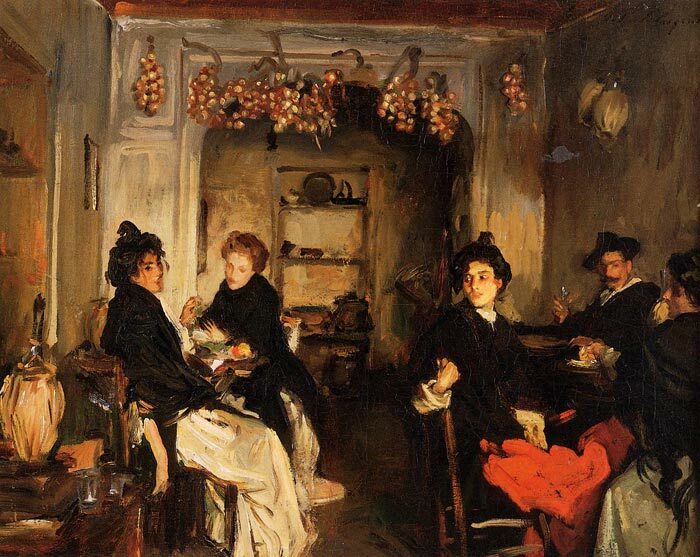 They discuss the evolution of Sargent’s style, the topography of his work in Venice, his connections with Henry James and other Americans in Venice, Italian artists in Venice in the nineteenth century, and American artists in Venice in the nineteenth century. He made his first visit to Venice in 1870, returning more than ten times over the next 40 years and taking this city as the subject of his art more frequently than any other: in effect, his particular love of Venice would, from the 1890s to 1913, be reflected in the 150 or so oils and watercolours. Approximately sixty of these works were shown in the Museo Correr exhibition. The first Venetian show to be entirely dedicated to the artist, this exhibition took the form of a gondola ride down the Grand Canal. Sargent often painted from within a gondola, rendering the unusual views afforded by this low vantage point. Palaces, churches, campi and canals are all enlivened by the play of light on water and architectural details. However, alongside views of famous monuments such as the Rialto Bridge, the Doge’s Palace and the Church of the Salute, there are also evocations of daily life in the Venice of the time: interiors of workshops, crowded streets, women at work, busy cafés and osterie, etc. And whether interiors or external scenes, each of these works reveals the dominant features of Sargent’s art: exploration of light effects, freedom and precision of line, perfect mastery of form. The Mauritshuis, The Hague, 4 November 2010 to 30 January 2011 "Made in Holland: Old Masters from a private collection in America"
Following the tremendous public and critical acclaim of PEM's 2011 exhibition, Golden: Dutch and Flemish Masterworks from the Rose-Marie and Eijk van Otterloo Collection, the museum is proud to once again exhibit works from the renowned Van Otterloo collection. Featuring 17th century paintings, Golden Light, Selections from the Van Otterloo Collection explores Dutch art and life in the 1600s. This new installation features 15 paintings by Jan Lievens, Emanuel de Witte, Pieter Claesz, Jan Brueghel the Elder and notable others. Maria Schalcken (ca. 1647/50 - 1684/1709), The Artist at Work in Her Studio, ca. 1680, Oil on panel, The Rose-Marie and Eijk van Otterloo Collection. 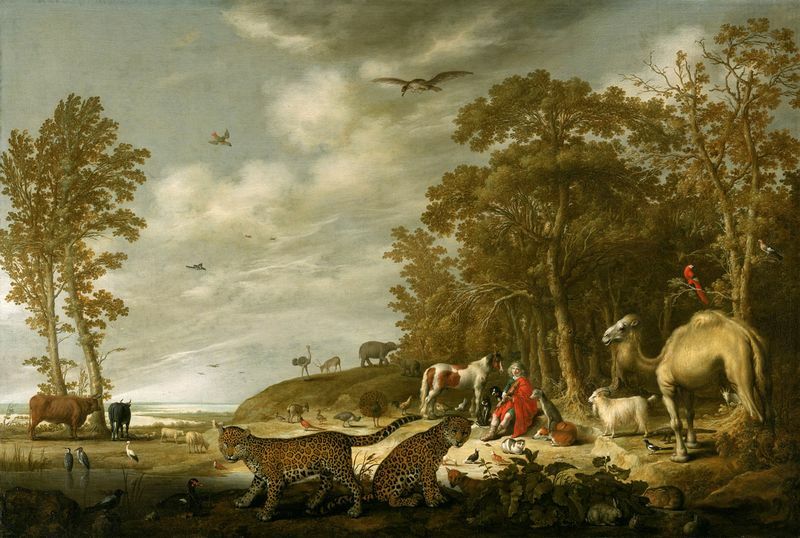 A selection of highlights from the remarkable art collection of Eijk and Rose-Marie de Mol van Otterloo was on display at the Mauritshuis in The Hague in 2011. The exhibition Made in Holland: Old Masters from a private collection in America featured 44 masterpieces produced by Dutch masters during the Golden Age. Not only are these works of outstanding quality, their subject matter is often intriguing. The selection included works by Rembrandt, Frans Hals, Paulus Potter, Jan Steen and Hendrick Avercamp. Dutch collectors Eijk and Rose-Marie de Mol van Otterloo, started collecting after their marriage in 1974, initially acquiring antique carriages and English sporting prints. Peter Sutton, current director of the Bruce Museum in Greenwich, Connecticut, suggested that they collect works by seventeenth-century Dutch masters. Simon Levie (advisor from 1995), former director of the Rijksmuseum in Amsterdam, and Frits Duparc, former director of the Mauritshuis (who took over from Levie in 2009), were closely involved in shaping this exceptionally beautiful collection. ‘love at first sight’. Masterpieces by Aert van der Neer, Esaias van de Velde, Gabriel Metsu, Salomon de Bray and Pieter Claesz were acquired in 2008 and 2009. A pretty, yet insolent young girl, a dog sleeping peacefully, winter landscapes or a summer scene with shepherds and picturesque mountains: the pictures in Made in Holland illustrate the versatility of seventeenth-century Dutch painting. In the exhibition, first-rate paintings will be grouped in ensembles, with an emphasis on still lifes, landscapes, genre paintings and portraits. Among the still lifes, a number of rare works by painters from Middelburg, including Balthasar van der Ast, Ambrosius Bosschaert and Adrian Coorte, are of particular interest. These will be shown alongside works by famous still-life painters such as Jan Davidsz de Heem and Willem Heda. 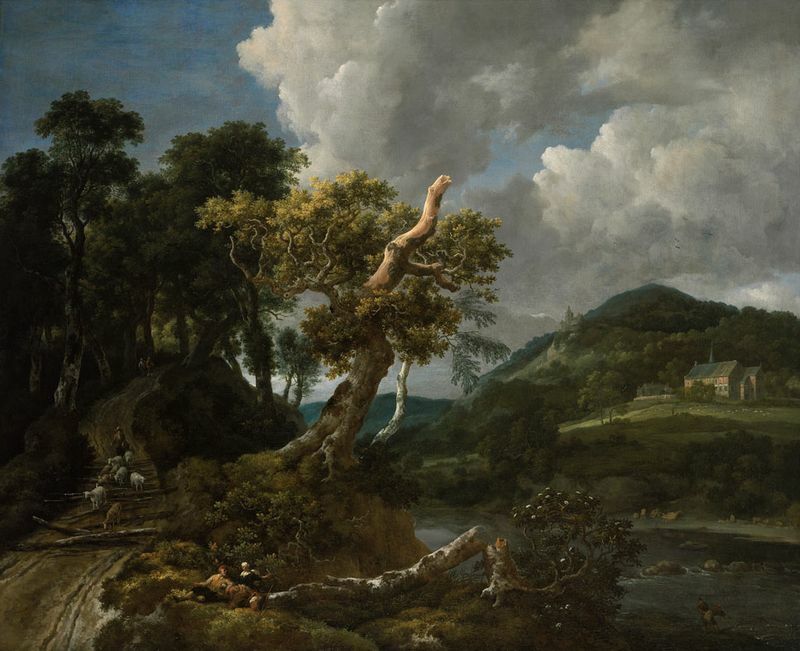 The Dutch landscape is well represented with, among others, three works by the leading landscape artist of the Golden Age, Jacob van Ruisdael. 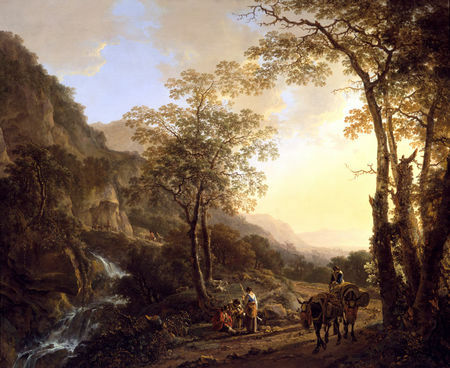 The work of Nicolaes Berchem, Jan Both, Karel du Jardin and Adam Pijnacker focuses on the Italian landscape. Father and son Willem van de Velde the Elder and Willem van de Velde the Younger depict the Dutch Republic as a seafaring nation. Admirers of seascapes like also enjoyed Jan van de Cappelle and Simon de Vlieger’s beautiful paintings. In 2011, the complete collection of paintings, together with a smaller collection of antique furniture and objets d’art, went on display in the Peabody Essex Museum in Salem, Massachusetts. The exhibition then moved to the Fine Arts Museums of San Francisco and finally to the Museum of Fine Arts in Houston. The 68 exquisite paintings in the Van Otterloo collection - portraits, still lifes, landscapes, history paintings, maritime scenes, city profiles and genre scenes - were created in the 1600s as the Dutch Republic increased in maritime strength and dominated international trade. 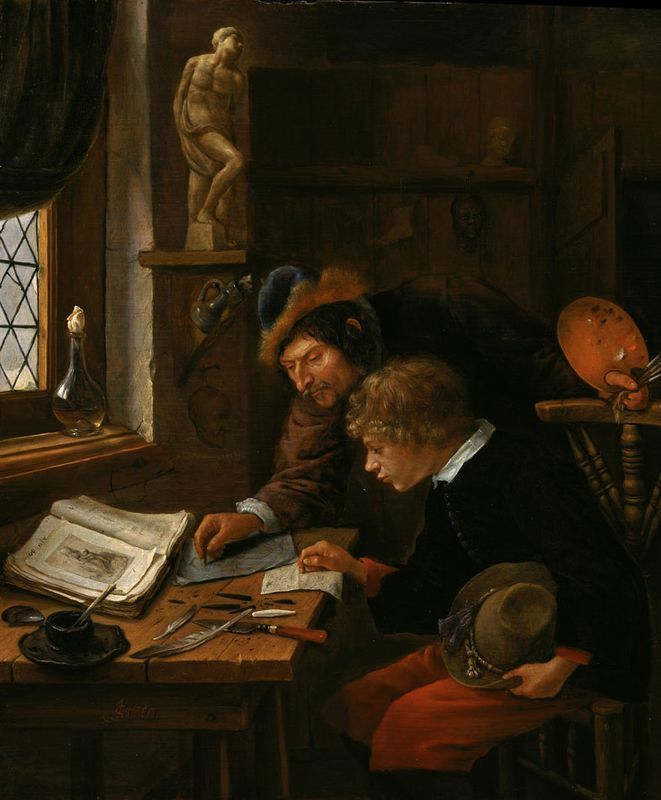 Elsewhere in Europe, the nobility and the Catholic Church were the principal patrons of the arts, but in the Netherlands, merchants supported artists in unprecedented numbers. Corrigan notes that "the creative revival and widespread patronage of the arts in the Netherlands was by no means limited to paintings. Master craftsmen created works in silver, wood and mother-of-pearl that were equally prized by their collectors." The exhibition also features twenty-three examples of furniture and decorative arts from the Van Otterloo collection. 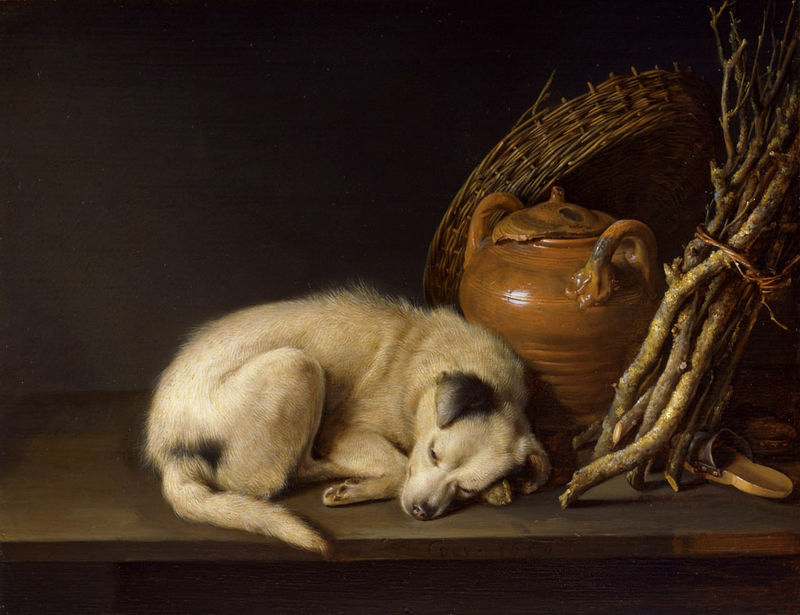 All of these works graced domestic spaces in the Netherlands as people began to invest enthusiastically in fine art and welcome it into their homes. Eijk van Otterloo was born in the Netherlands and Rose-Marie in Belgium. They met and married in the United States, where they developed deep ties with New England. The couple enjoys living with their collection, but they are also dedicated to sharing it with others, generously lending to institutions around the globe. The Van Otterloos have said, "With Golden, we are delighted to have this opportunity to share the entire collection with the American public. Within these works of art lie a world of beauty, meaning and even humor. We hope that visitors to the exhibition receive as much pleasure, inspiration and delight from them as we do." Over the last two decades, the Van Otterloos have assembled a Dutch and Flemish collection reflecting their cultural heritage and rivaling any of its kind in the world. 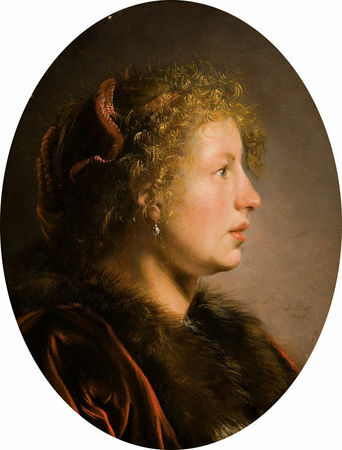 With expert guidance from Dr. Simon Levie, former director of the Rijksmuseum in Amsterdam, and Dr. Frederik J. Duparc, former director of the Mauritshuis in The Hague, the Van Otterloos established clear goals and criteria, making the choices - sometimes to acquire, sometimes to decline or sell- that hone a connoisseur's discerning eye. Great works of art transcend categorization, but to provide context for the vast flowering of Dutch and Flemish art in the Golden Age, the exhibition is organized to reflect the principal themes that artists explored in this period. Lured by religious freedom and a better economic climate, many artists fled northward from cities such as Antwerp, Brussels and Bruges to escape persecution and the war with Spain in the late 1500s and early 1600s. They introduced sophisticated new painting styles and together with Dutch artists created a climate of artistic excellence in the Dutch Republic. Artists emphasized the horizon line and changing weather conditions of the Dutch countryside, often populating scenes with engaging details of daily life. 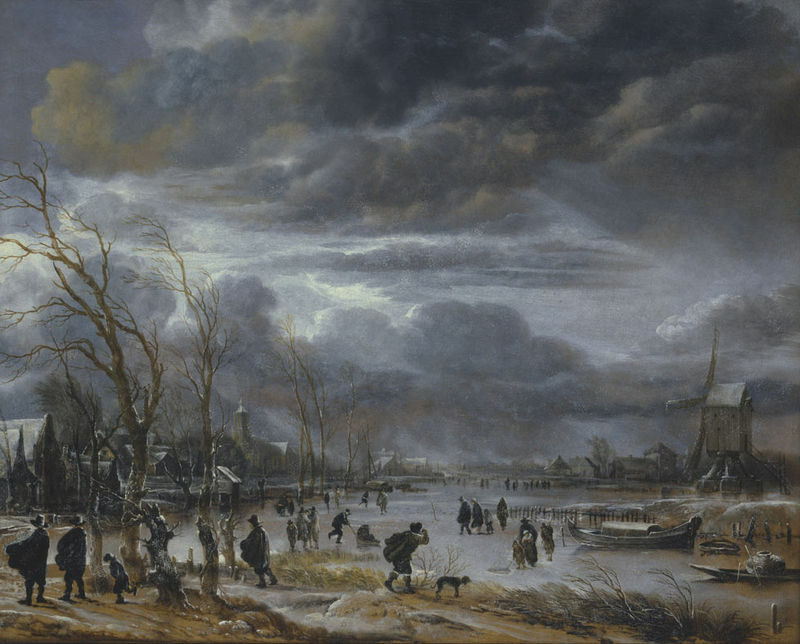 From the 1560s to the 1620s, Northern Europe endured an extremely cold period known as the "Little Ice Age." 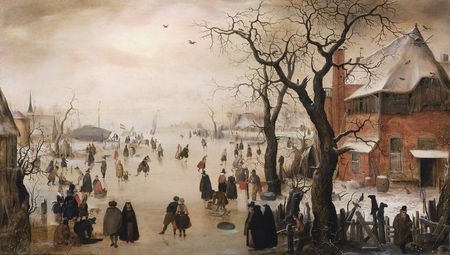 Inspired by the winter landscapes of Flemish artists who had fled to Amsterdam,Hendrick Avercamp elevated the subject to a new genre in works such as his Winter Landscape Near a Village. Dutch cities swelled with the influx of immigrants from the south taking refuge in religiously tolerant, albeit strongly Protestant, urban environments. Protestant churches in the Netherlands were largely devoid of religious imagery. Instead, artists painted images of biblical figures and contemporary religious structures such as Jan van der Heyden's View of the Westerkerk, Amsterdam for display in people's homes as expressions of their piety and affluence. Successful merchants, powerful politicians, influential scholars and other prominent individuals often commissioned portraits of themselves, their spouses, and sometimes their children. Rembrandt's portrait of Aeltje Uylenburgh, the unquestionable jewel of the Van Otterloo collection, is one of the finest portraits by Rembrandt in private hands. 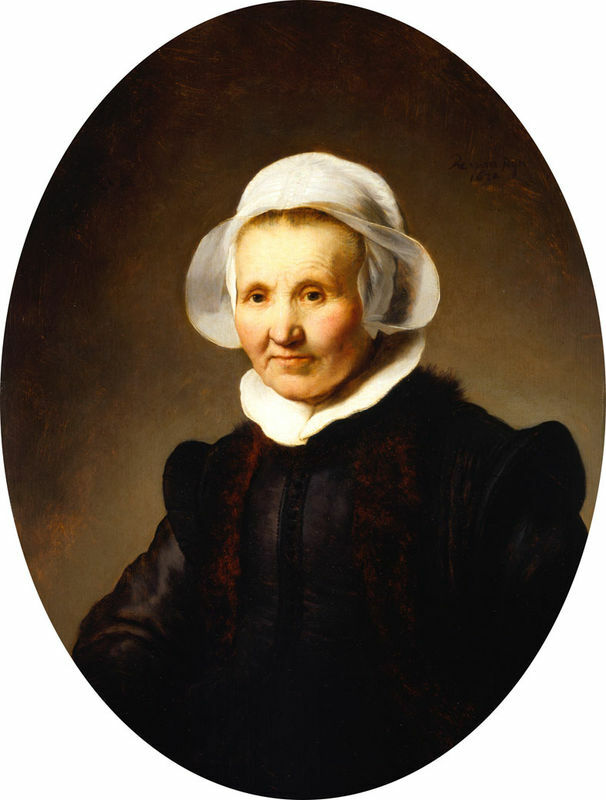 Although the artist painted it when he was only twenty-six, Rembrandt sensitively rendered the effects of age and tenderly captured his subject's soft cheeks, bright eyes, and crisp linen cap. The daily lives of the rich and poor became a new subject for painting during the Dutch Golden Age. These sometimes humorous genre scenes also contain allegorical symbolism. The importance of frugality and modesty, and the fleeting nature of life, were especially popular themes in a society grappling with how to express its new-found prosperity while maintaining a pious and humble lives. In this scene by Nicolaes Maes, a woman deftly picks the pockets of a sleeping man while coyly inviting the viewer's silence. A beautiful and perhaps cautionary still life of glasses, jars, pipes and tobacco alludes to the sources for the man's drowsy vulnerability. 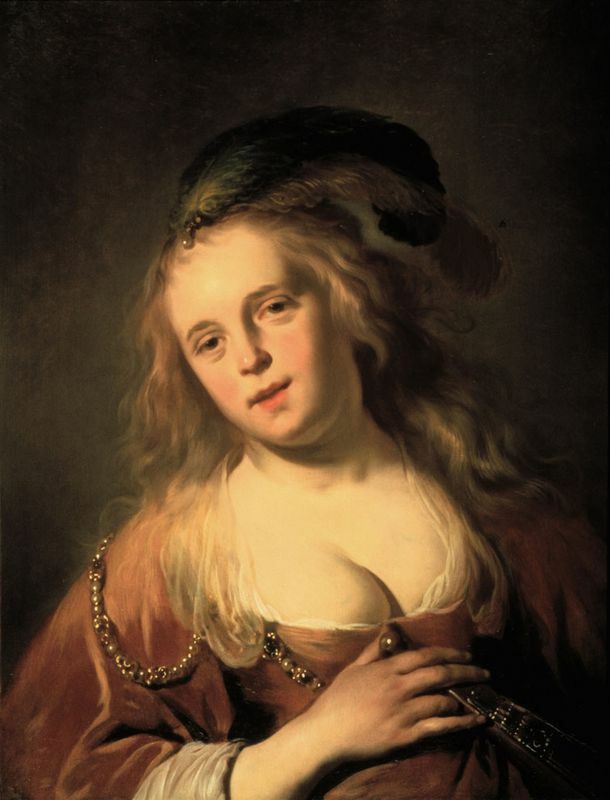 Maes studied with Rembrandt and is regarded as one of his most important pupils. 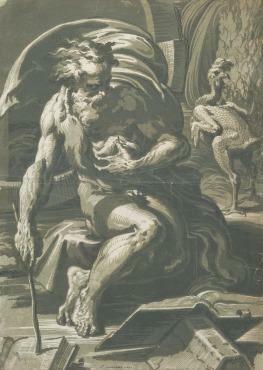 Intrigued by new translations of ancient Greek myths, many Dutch artists incorporated classical imagery in their work. In this monumental canvas by Aelbert Cuyp, Orpheus plays the violin for an enchanted menagerie of animals from Europe and around the globe. 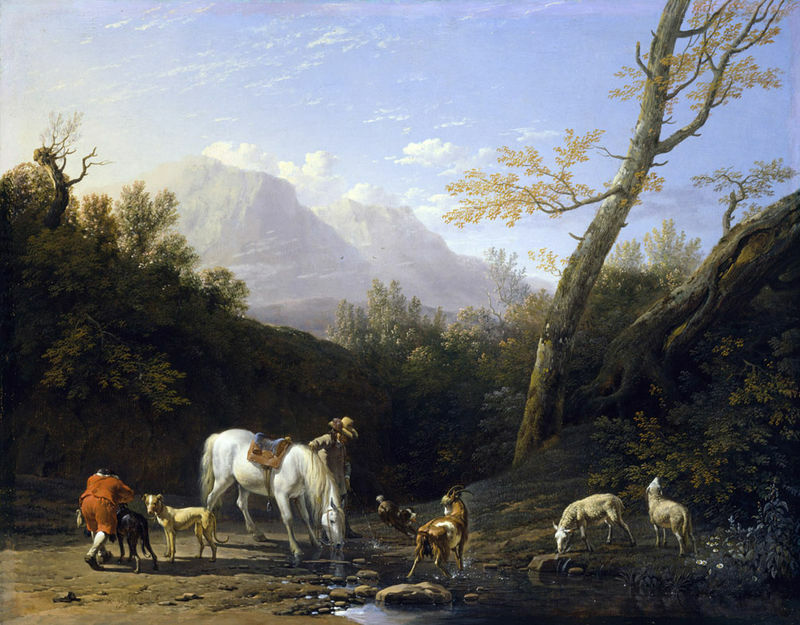 Cuyp's ambitious paintings not only highlight his skills as a landscape and animal painter, but also the era's lively exchange of artistic, literary and scientific ideas. Cuyp, who never left Europe and would not have seen many of these animals firsthand, drew upon prints and stuffed specimens in aristocratic "cabinets of curiosities" to depict them. 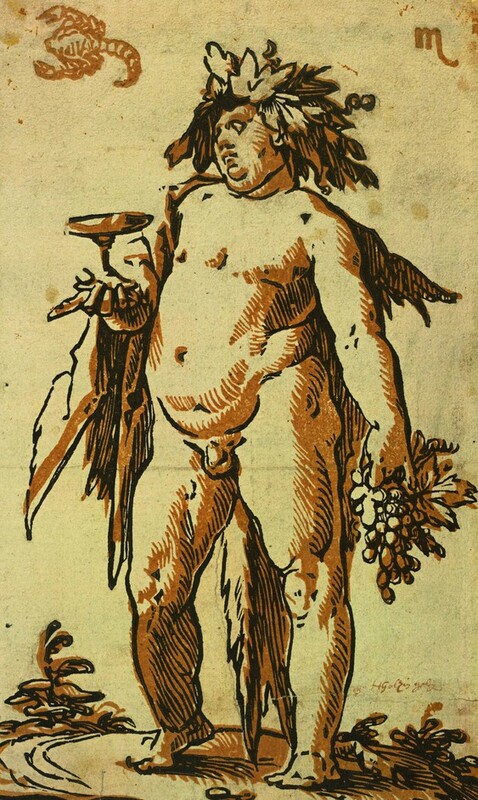 Allegorical imagery was not limited to paintings in 17th-century Dutch households. The owner of this stunning four-door cupboard could display it and avoid the criticism of ostentation because the cupboard served as a daily reminder of his religious obligations-a veritable "sermon in wood." The Dutch Republic dramatically expanded its influence and financial prospects through voyages around the globe, becoming the dominant international maritime power in the 17th-century. Accordingly, Dutch artists were the first to paint the sea in its own right - a reflection of the importance of water in the nation's psyche. 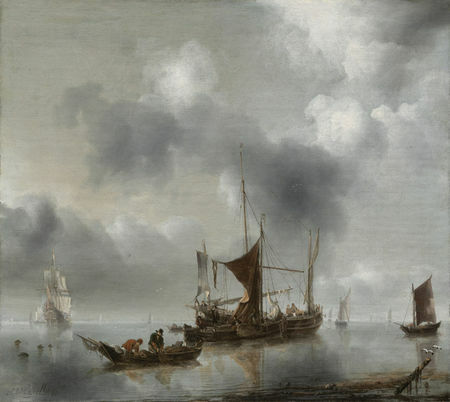 Maritime views are often characterized by precise depictions of ships and atmospheric rendering of the weather. The fertile landscape was similarly a favorite new subject. Cloud-filled skies billowing over a narrow stretch of earth or sea emphasize the flat horizons for which the Netherlands is known. 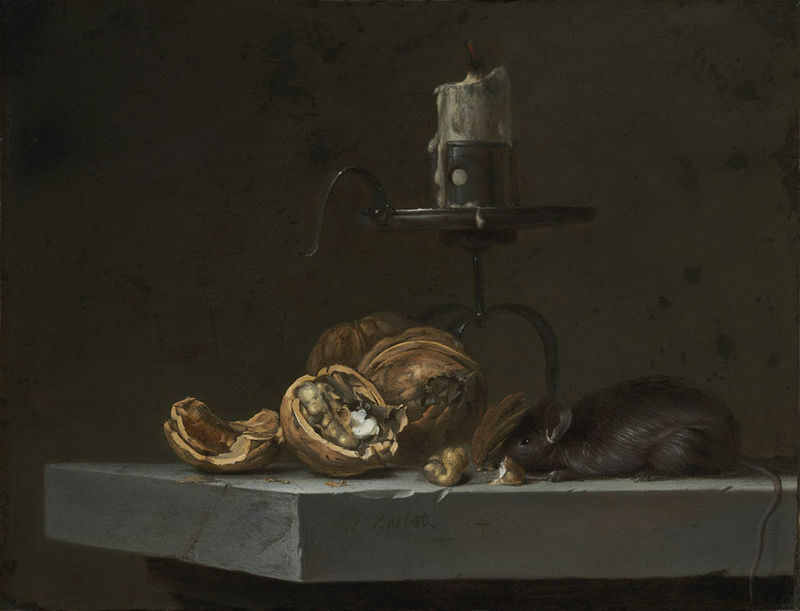 The carefully balanced compositions in Dutch still lifes are often visual odes to prosperity and pleasure with elements of moralistic symbolism. 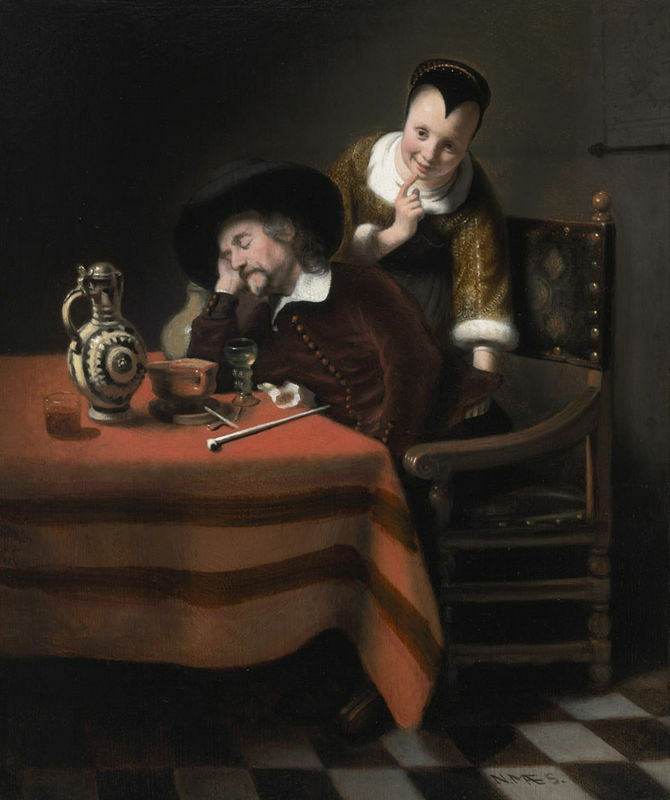 As the nation emerged as a powerful mercantile force, Dutch artists filled their canvases with the staples and luxuries of the trades they dominated - Dutch cheese, French wine, Baltic grain, South American tobacco, and Asian porcelain and pepper. When painting seemingly informal assemblages, Dutch artists played with balance and depth to enhance the drama and intimacy of the scene. In Jan Davidsz. 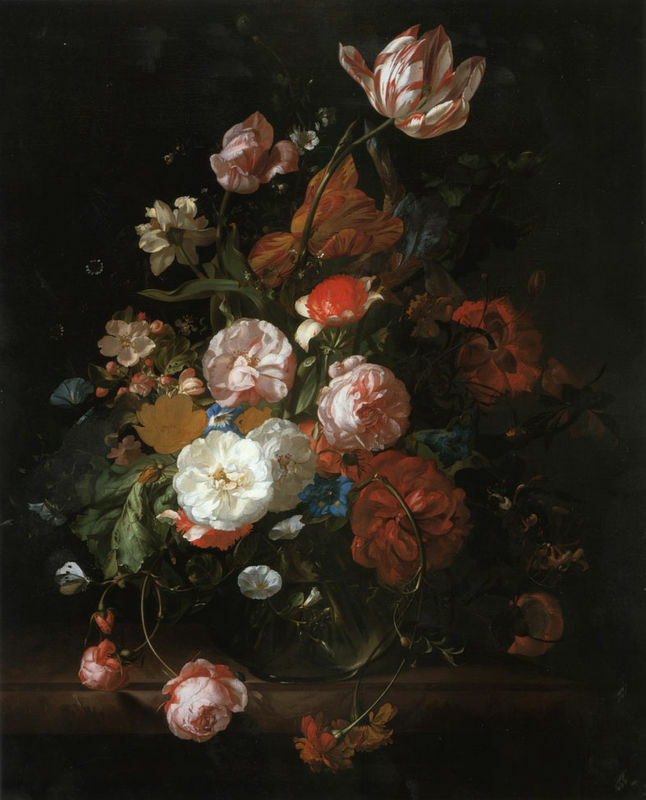 de Heem's Glass Vase with Flowers on a Stone Ledge, the artist used light in innovative ways, spotlighting the intensely colored flowers against a deep black background. The vase contains flowers that bloomed at different times of the year, somehow enhancing their beauty by combining faithful representation with impossibility. 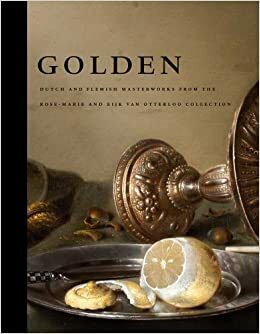 Golden: Dutch and Flemish Masterworks from the Rose-Marie and Eijk van Otterloo Collection. Peabody Essex Museum in conjunction with the Mauritshuis, The Hague, and in association with Yale University Press. 2011; 404 pages. with Harold Gillies’ rarely shown photographs of facially injured soldiers from the Royal College of Surgeons. Showing how the First World War was depicted and reported with a degree of visual detail unprecedented in the history of conflict, the exhibition includes photography and film as well as formal portraits. Rather than presenting a military history of the War, the Gallery aims to focus on its human aspect, concentrating on the way the Great War was represented through portraits of those involved, an approach never previously adopted. The Great War in Portraits takes an international perspective. As well as iconic portraits of Siegfried Sassoon, Wilfred Owen and Winston Churchill, the exhibition reflects the war experience of those from all social classes who served from throughout the Commonwealth. one of the great early modernist works related to the War; a contrasted pairing of British and German films devoted to the Battle of the Somme never previously seen together; and a rare photograph by Jules Gervais Courtellemont depicting a deserted, battle-scarred landscape. The only work in the exhibition not to depict people, this poignant image is, in effect, a portrait of absence. Starting with the eve of war, the exhibition includes imposing formal portraits of the heads of state of the participating nations, evoking those countries that would be drawn into the conflict in 1914. Such grand images are brought into sharp contrast with an understated press photograph of a pathetic-looking Gavrilo Princip, the 19-year-old student whose opportunistic assassination of Archduke Franz Ferdinand, on 28 June 1914 precipitated the First World War. In the central section titled ‘The Valiant and the Damned’, Portraits portraits of Victoria Cross holders, medal-winners, heroes and aces are shown juxtaposed with depictions of those whose lives were marked in different ways: casualties, those disfigured by wounds, prisoners of war, and those shot at dawn for cowardice. 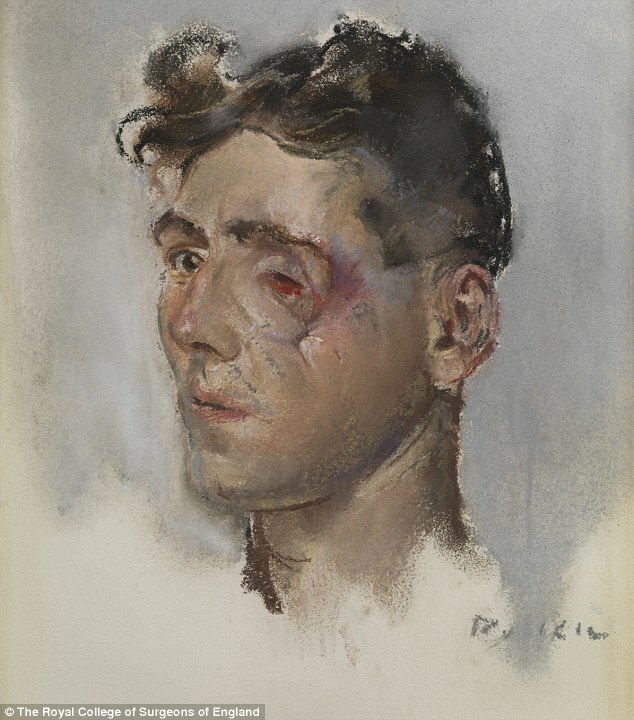 The idealised language of formal portraits, used as celebration and eulogy, is brought into violent discord with those images, such asnotably a selection of Henry Tonks's pastels of servicemen grotesquely disfigured by wounds, that reveal individual suffering and the human cost of war. The exhibition is complemented by a fully-illustrated book by Paul Moorhouse with an essay by Sebastian Faulks. The show’s centrepiece is a vast, 40-photo grid of all manner of Great War participants. Some are familiar (Wilfred Owen; Baron von Richthofen; Mata Hari); others less so. We meet Walter Tull, the first black officer in the British army; Billie Nevill, the captain who kicked a football across No Man’s Land; Maria Botchkareva, leader of Russia’s women-only Battalion of Death; and Harry Farr, the shell-shocked private executed for desertion in 1916 (and officially pardoned in 2006). Their grouping underscores the indiscriminate way the Great War sucked people from all backgrounds into its vortex. Undoubtedly the most moving images on show, though, are the pastel drawings by Henry Tonks of facially disfigured soldiers awaiting reconstructive surgery back in Blighty. 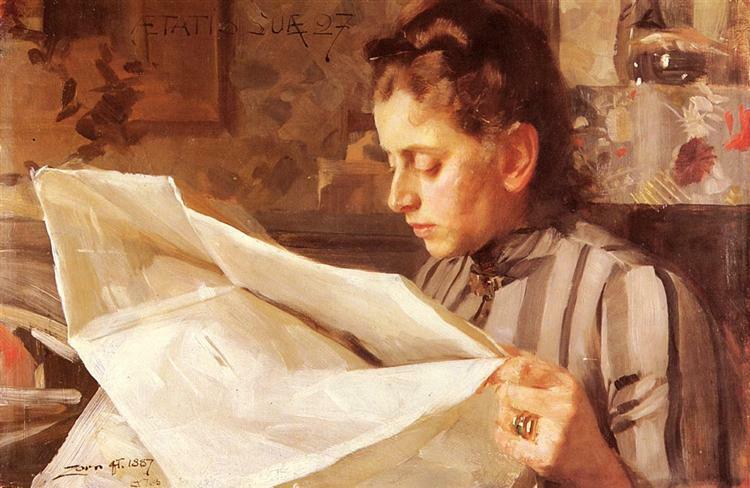 The National Academy presents a major retrospective of Anders Zorn (1860-1920), one of the greatest Swedish painters at the turn of the 20th century. A virtuoso watercolorist, bravura painter, and etcher, Zorn rose from humble beginnings in the Swedish countryside to travel the world, captivate American artists and politicians alike, and paint some of the most-sought after portraits of America’s Gilded Age. Featuring 90 rarely seen works, oil paintings, watercolors, etchings, and sculptures, drawn from public and private collections throughout Europe and the United States, this major retrospective, on view February 27 through May 18, 2014, reveals the vibrant artistic personality of Sweden’s master painter. A truly international artist, Zorn’s traveled early in his career to Spain and Algeria where the intense color and light inspired this skillful watercolorist to perfect his craft. Later in Paris, influenced ̶ by the Impressionists, he chronicled modern life, while in America he rivaled John Singer Sargent as the most sought-after portraitist of high society. During his seven trips to the United States, he portrayed bankers, and industrialists including Andrew Carnegie, and even three presidents - Presidents Grover Clevand, Theodore Roosevelt, and, in a portrait that still hangs in the White House today, William Howard Taft. Back in Sweden he painted scenes of the Swedish countryside, his native folk culture and the beauty and serenity of the Nordic landscape. The illegitimate son of a Bavarian brewer, Zorn was born into humble circumstances in 1860. 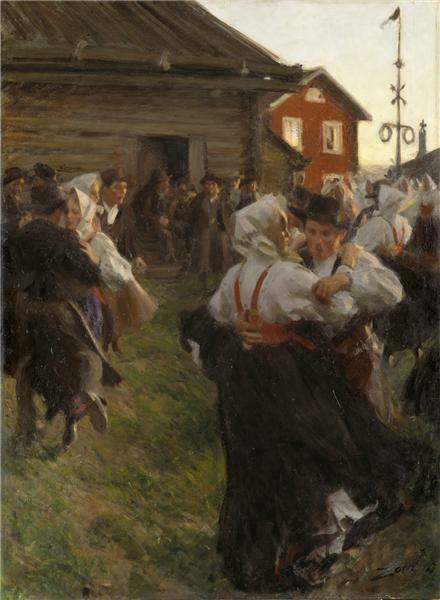 Raised by his mother on his grandparents’ farm in Mora, Sweden, Zorn’s artistic virtuosity blossomed early. At the age of fifteen, he was accepted into the Royal Swedish Academy of Fine Arts in Stockholm. Soon after, one of his paintings was purchased by King Oscar II of Sweden. Zorn temporarily relocated to Paris just in time for the Exposition Universelle of 1889, a breakthrough moment his work as a painter. He was shortly thereafter decorated with the Legion d’Honneur, the most prestigious order in France. Over the course of seven extensive visits to the United States, Zorn became one of the most sought-after portraitists of the Gilded Age—rivaling John Singer Sargent in popularity. He painted in an elegant, assured style that captivated wealthy, influential members of society: American bankers, industrial magnets, and politicians. His involvement with the Swedish section of the World’s Fair in Chicago in 1893 led to his meeting with many members of American high society, including influential art collectors Charles Deeving and Isabella Stewart Gardiner, whom he went on to paint and etch. which revels in rural traditions, is considered one of Sweden’s national treasures. This exhibition features the beautiful art of Chiaroscuro woodcuts in works from two of the finest collections in the world. Conceived as independent works or based on the designs of the greatest Renaissance artists such as Parmigianino, Raphael and Titian, this pioneering 16th-century printing technique breathed new life into well-known biblical scenes and legends; from Perseus slaying the Medusa to Aeneas Fleeing Troy, and the Miraculous Draught of Fishes. 150 of the rarest and most exquisite examples of this forgotten art form, with a focus on the craftsmanship of its proponents in Germany, Italy and the Netherlands, demonstrate how the chiaroscuro method was used to create the first colour prints that make dramatic use of light and dark. Created by established artists for a wider public, they were collected and appreciated both as mementos of famous works in other media and in their own right for their sheer technical brilliance and visual power. Domenico Beccafumi, 'Group of Men and Women', c. 1545-47. Engraving with two woodcut tone blocks, in pale blue and blue. 14.3 x 22.2 cm. Albertina, Vienna. Photo Albertina, Vienna. Giovanni Gallo, after Marco Pino, 'Perseus with the Head of Medusa', 1570s. "Chiaroscuro woodcut printed from four blocks, the tone blocks in orange and reddish brown. 35.1 x 22.8 cm. Albertina, Vienna. Photo Albertina, Vienna. Hans Burgkmair the Elder, 'Hans Paumgartner', 1512, Chiaroscuro woodcut printed from three blocks, the tone blocks in violet. 29.1 x 24.1 cm. Albertina, Vienna. Photo Albertina, Vienna. Hendrick Goltzius, 'Landscape with Trees and a Shepherd Couple', c. 1593-98, "Chiaroscuro woodcut printed from three blocks, the tone blocks in pale green and green. 11.7 x 15.3 cm. Collection Georg Baselitz. Photo Albertina, Vienna. Organised by the Royal Academy of Arts, London and the Albertina, Vienna. Hans Burgkmair the Elder, 'St George and the Dragon', c. 1508-10." "Chiaroscuro woodcut printed from two blocks, the tone block in beige. 31.9 x 22.5 cm. Collection Georg Baselitz. Photo Albertina, Vienna. Organised by the Royal Academy of Arts, London and the Albertina, Vienna."